Holy Moly, folks... I feel like it's been forever since I've posted. Sorta feeling like I've been swallowed by my bathroom! So, let's see... since I last blathered about this topic there have been many trials and tribulations, but I am making progress. I was gonna go through each of my hurdles and whine about them all, but I decided that you're probably not all that interested. So here's the abbreviated version. I had to install a new toilet shut-off valve and deal with a lead flange and lead bend drain pipe that weren't installed properly to begin with. 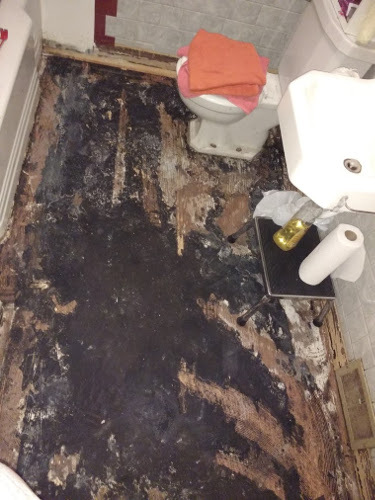 This involved a week or two of research, and I thought I might actually have to tear out the sub floor and have the entire toilet drain re-plumbed. But I managed to come up with a solution that didn't involve going that far. So then it was FINALLY on to the tiling part. As it turned out, Lowe's wouldn't cut the tile for me after all, so I ended up buying a wet saw - which turned out to have a bent blade... which I didn't realize until CatMan told me that the thing should NOT be vibrating so strongly that it walks across the workbench. So that had to be returned and replaced. I ended up re-working my pattern a zillion times to come up with something that was both aesthetically pleasing and minimized the difficult cuts... I still butchered a few pieces of tile, but at least I didn't saw any fingers off. Then I had to go on an adventure figuring out which sort of mortar to use for the underlayment and the tile... and it got complicated - and I ended up having to drive all over town to get the right stuff. 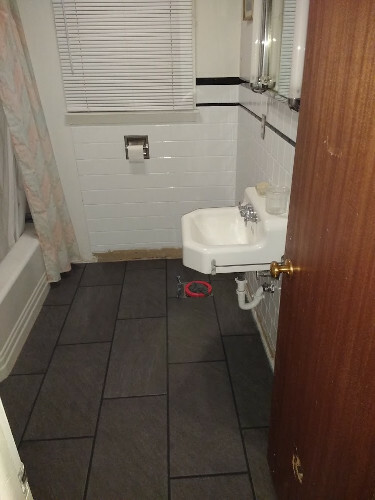 And then I had a bit of difficulty using the "single component" grout which resulted in me screaming at the top of my lungs at 1 o'clock in the morning after many, many hours of fighting with the stuff. At which point I realized that the window was wide open, and I started wondering if one of the neighbors was gonna call the cops. Nobody did... and I'm not sure if that's comforting or not. But anyhow, the final step (so far) was to paint the hideous plastic wall tile... which I just finished a few hours ago. It's sorta hard to get a decent angle for a photo in such a small room, but you get the idea. So tomorrow the toilet goes in... Oh, I can't wait to not have to run down to the basement bathroom umpteen times a day! And I really hope that the flange extender/repair system that I bought works! I had to special order baseboards because I needed a funny height - but they should arrive next week. And now that the wall tile is all painted, the wall is looking quite dingy to me. I think maybe I'll paint it a very light gray color. And, of course I need to replace that horrible mauve colored tub surround... but I did manage to get the shower diverter valve fixed... which means that I don't actually have to tear out the wall and replace the faucet, I can just do the tub surround. And once that's done, I can have the tub resurfaced. Of course... doing all this makes me want to replace the sink with a vanity and replace the medicine cabinet... but that will mean tearing out the plastic wall tile and dealing with all that... so I think that part will have to wait a while. Gah! Well, so far my little project, which I naively waded into thinking it would take me 2-3 days has taken about 5 weeks. Oy! I suppose that's to be expected though, when you don't really know what you're doing, and every step of the way you have to stop and do a bunch of research and then bumble your way through. Thank God for the interwebs though. I can't imagine how anyone ever managed a DIY project without it! Anyhow, that's pretty much what I've been up to for the past month! If I wasn't so tired, I'd go back and fill this post with cute kitty pictures, but instead, I think I'll just go collapse in bed. Hope you're all happy and well, and enjoying the beginning of autumn! Well folks, I knew I was getting off easy by uncovering those beautiful floors under my horrible avocado green shag... apparently I shouldn't have pushed my luck. 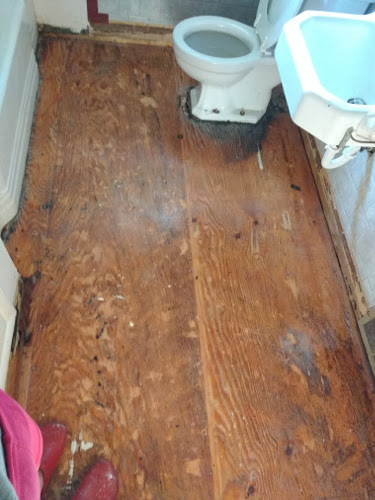 I decided that I really needed to pull the horrible carpet in the bathroom. 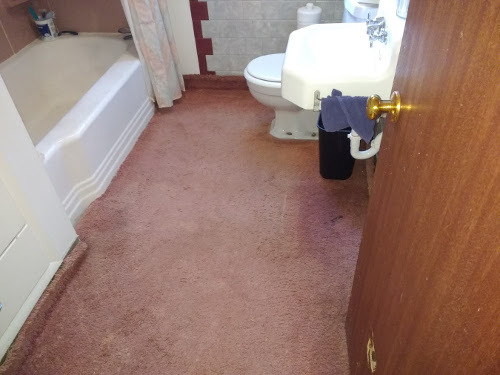 Partly because it was just horrible - really, who puts carpet in a bathroom? - and partly because one of the nests of carpet beetle larvae that I discovered was right at the bathroom doorway - and why would they stop at the doorway? I didn't really feel up for a whole bathroom remodel. 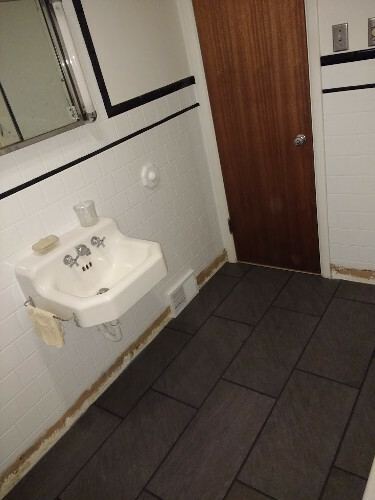 I didn't want to pull the toilet, or do major demolition... just wanted to get the carpet out of there. So I crafted a plan. 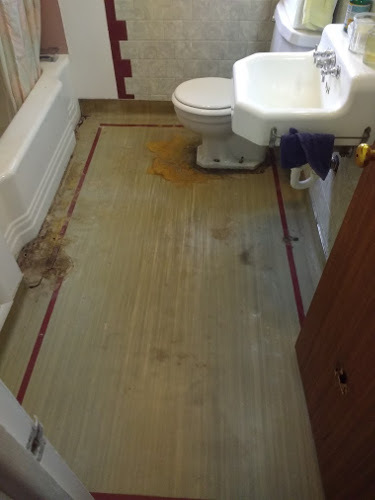 I figured I'd just pull up the carpet to expose the ugly linoleum underneath, and then I'd cover that with a layer of cheap peel and stick vinyl flooring. Not a long term solution - but enough to give the room a small facelift and deal with the current problem. Alas, it was not just ugly, but also damaged beyond the point where my peel and stick solution was gonna work. But more seriously, I discovered that the toilet had been leaking for God knows how long. Soo.... out the window flew my "easy makeover" plans. None of the YouTube videos mentioned anything about tar paper! And the heat gun/iron/steamer removal method that looked so easy in the videos, only turned this flooring into a melted mess - which made removal much more difficult. Gotta say, I was feeling pretty darned hopeless at this point. I scoured the interwebs with a new set of search terms, but everything I found showed people using steam or heat to remove this stuff. I don't know if I was dealing with a qualitatively different sort of tar paper or what, but heat just turned this stuff into... well, into tar - like roofing tar. I was lucky if I could get off one square inch at a time. But then... then... I stumbled upon an unlikely savior! Late one night in a Googling frenzy I happened upon a video of a young woman in a similar situation, with a rather unorthodox solution. She took old towels laid them out on the floor, then saturated them with diet Coke and let it sit overnight. Then the tar paper just scraped off like butter! It sounded sorta crazy, but it did trigger a memory from long ago. When I was in college I was on a work study program, and I spent my freshman year working in the cafeteria kitchen. One day while working on the cleanup crew, the fry cook handed me an empty pitcher and asked me to fill it with carbonated water from the soda machine. I couldn't quite figure out what she was gonna do with the stuff, and I was totally shocked when she dumped in on the griddle and the thick layer of grease just slid off! Turns out the carbonic acid in the carbonated water eats through grease. It took 24 hours of soaking, and a razor blade floor scraper, but.... finally... success! But now what? 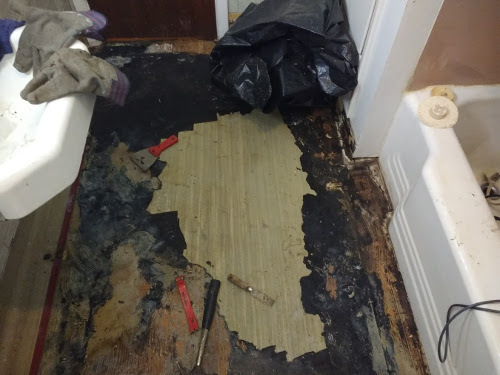 Well, it turns out that vinyl peel and stick flooring isn't recommended for bathrooms unless you have an impervious layer like old vinyl or linoleum underneath it. So I've spent the last week or so doing extensive research on every flooring system on the market. I seriously considered a next generation vinyl floating floor system - no glue, really easy to install, and waterproof, but there were just too many issues for me to want to go that way. First of all, it's vinyl... which means plastic. And while people are singing the praises of these systems, there are a few caveats to their use. 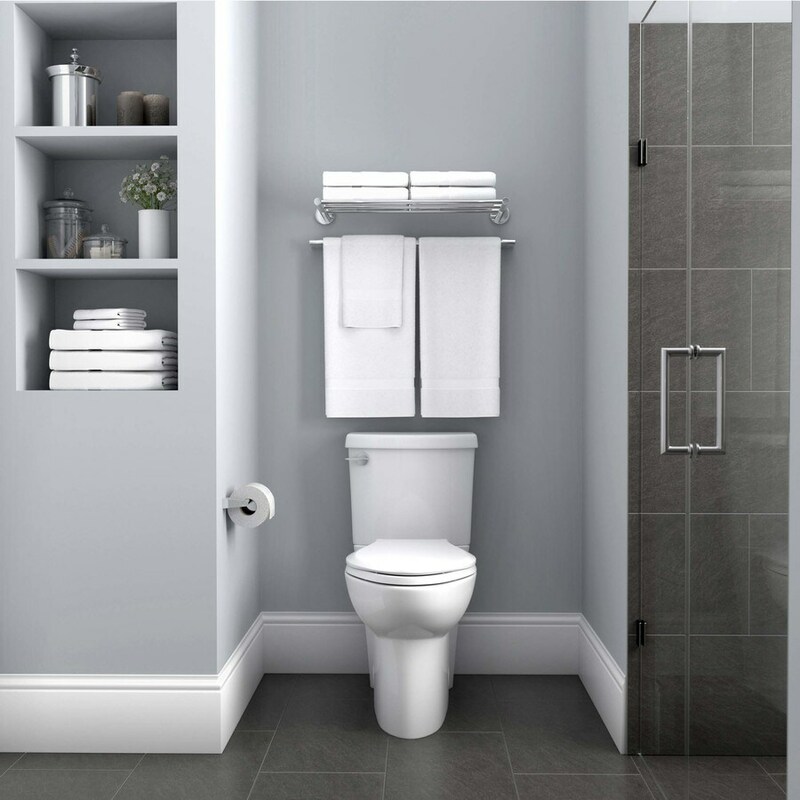 You're not supposed to put them in rooms with a lot of direct sunlight - and this bathroom has a west facing window which bathes the room in sun all afternoon. The sunlight is problematic both because it heats the floor and causes expansion, and because it can cause discoloration. I have a friend who put white vinyl in her kitchen, and 2 years later she has a horrible yellow swath across the room from where the sunlight from the west facing window falls. But more seriously, it really limits what you can do with the room going forward. 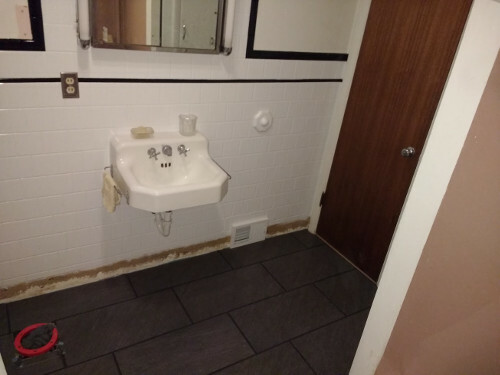 Apparently you're not supposed to put permanent fixtures (like a vanity or pedestal sink) on top of this sort of flooring system, because the floor needs to be able to expand and contract with changes in heat and humidity. And since there's a real likelihood that the sink will need to be replaced sooner rather than later... well, I just didn't want to limit myself in that way. So... ceramic tile it is! You know what they say... in for a penny, in for a pound! 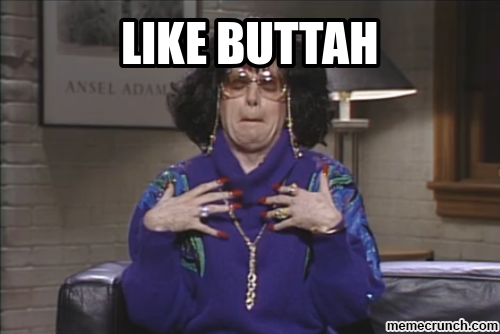 And that's meant that I've had to immerse myself in researching underlayments, and tile, and mortar, and grout. Holy Moly! Who knew there were so many variables? 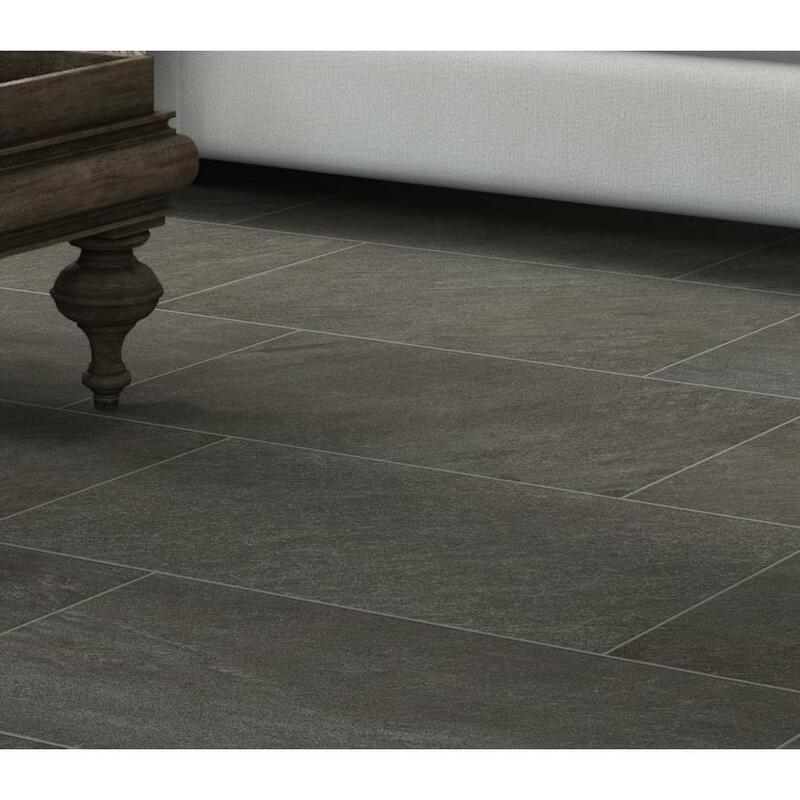 But after looking at quite literally thousands of different options, I've finally decided on a charcoal colored porcelain tile that gets rave reviews, should look great, and will leave many different doors open for whatever direction I decide to go with the rest of the room down the line. And... the nice fellows at Lowes will cut the stuff for me as long as I can provide measurements! So now I just have to work the puzzle and do a lot of math - oh... and pull the toilet... and then actually lay the tile... Oy! Wish me luck! 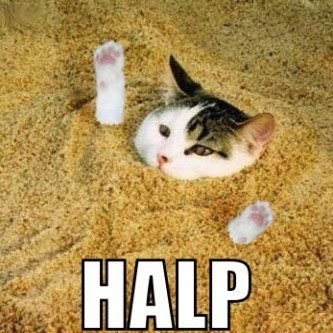 If you need to reach me, please feel free to email at EcoCatLady at Gmail dot com, but please know that I don't publish guest posts or do product reviews or any other sort of solicited post. The Christmas Crazy Flower is Blooming!!! Irina Neblea cures puppies of parvovirus in a field.